While all metal eyes are on 30, Metallica is also marking another anniversary on this year’s calendar: 20 years since the release of their self-titled album, commonly referred to as the “Black” album based on its cover art. 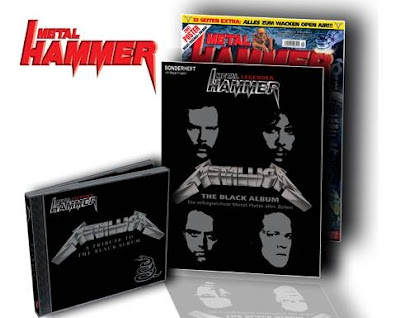 Now, 20 years later, and Germany’s Metal Hammer magazine is stepping up to mark the occasion with an anniversary version of the “Metallica” album featuring a wide variety of guest artists performing songs from the record. The tribute – which features Lemmy from Motorhead, DevilDriver, Sodom and Doro, among others – will be available with the September 2011 edition of the magazine, scheduled to hit German newsstands on August 24. * Lemmy - "Enter Sandman"
* The New Black - "Sad But True"
* DevilDriver - "Holier Than Thou"
* Darkage - "The Unforgiven"
* Callejon - "Wherever I May Roam"
* I.C.S. Vortex - "Don't Tread On Me"
* Neaera - "Through The Never"
* Doro - "Nothing Else Matters"
* Motorjesus - "Of Wolf And Man"
* Finntroll - "The God That Failed"
* Borknagar - "My Friend Of Misery"
* Sodom - "The Struggle Within"